Fake news, forgeries, copycats… no one likes a fraud. Right? Well, believe it or not, but we reckon you can have some real fun with these fake London landmarks. Next time you’re having a wander around Bayswater, keep your eyes peeled for these odd neighbours on 23 and 24 Leinster Gardens. While at first glance they seem to be perfectly normal, a closer look reveals that the windows are, in fact, painted on. The neoclassical facades you see from the road are all there is to these ‘houses’; built in the 1860s, their purpose was to hide an open air section of the underground on which locomotives would vent off steam. Bayswater being a posh area, the railway did their best to hide the evidence of this less pleasant aspect of their business. The result is this charming oddity, although the inhabitants of numbers 22 and 25 are probably particularly thankful for the invention of electricity. The Roman baths on Strand Lane have an intriguing history, not in the least because a large portion of it seems to be fictional. Built in the early 17th century, the ‘baths’ were in fact part of a fountain in the garden of Somerset House. In the 1770s they were first used as actual baths, but it’s in the 1830s that things get interesting: while under ownership of a Mr Charles Scott, the baths suddenly were marketed as ‘old Roman spring baths’. Mr Scott clearly had a nose for business, because within ten years or so, his business had firmly established itself in the collective consciousness as a relic from the Roman days. The most famous person to be taken in by this Victorian tourist trap was none other than Charles Dickens, who had David Copperfield have ‘many a cold plunge’ in the ‘old Roman bath’. While plunging is no longer an option, you can still peer down at this marvel of false advertising through a window on Surrey Street. Long gone are the days you could just stroll up to 10 Downing Street and pretend you were off to see the PM. But if you really want that selfie outside the UK’s second most famous address, you can pop over to 10 Adam Street. Located just off The Strand, its front door is a dead ringer for the one on Mrs May’s humble abode, and you can actually get close to it without being shot. Both doors are from the same period: the one in Downing Street was put in during renovations between 1766 and 1772, while work on the Adelphi complex on Adam Street began in 1768. So which door is the original, and which one’s the copycat? We’ll leave it up to you to decide. Speaking of famous addresses, fancy a visit to 221B Baker Street? Be warned if so, because it’s a bit more challenging than you might think. 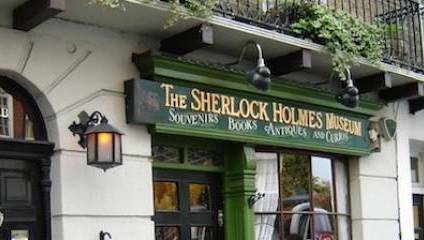 The obvious first stop is the Sherlock Holmes Museum, but, although they’ve been given permission by Westminster council to use 221B Baker Street as their address, the building is in fact located between numbers 237 and 241. The closest you’ll get to the actual address is the cake shop across the road on 222. Alternatively, head over to the corner of North Gower Street and Tolmer’s Square, where the BBC series Sherlock had the famous detective living. The last on our list is also the most macabre one: the head of philosopher Jeremy Bentham. As many a Londoner will know, Bentham’s ‘auto-icon’ (a nice word for corpse) can be seen at UCL, where the preserved skeleton sits in a wooden cabinet, padded out with hay and wearing Bentham’s clothes. While most of this bizarre spectacle is completely real, the head is a wax replica; the experimental mummification process used to preserve it had made it look rather like the stuff of nightmares. The wax head is kitted out with some of Bentham’s real hair, however, so we can’t discredit it as a fake entirely. The real head used to be on display as well, but is now safely stored after repeatedly having been stolen in student pranks.